Back a few years ago this wouldn't have bothered me. I use to love rodeos, but now I've become more aware of the animals that have been abused, not unlike the elephants and the bad rap the circus owners are getting for that. I wonder if this stadium will be used for anything else. Because one day, rodeos might have similar problems like the circuses are having. Besides, I think the church should be donating to better causes...just my opinion. I could think of a million charities that could use the dollars here. Every time to Church donates to such projects, they are improving the lives of countless members and non-members. Instead of handouts it,provides jobs, self reliance, self respect sending families to grocery stores, which provides jobs for others, instead of sending those same,people to the Bishop storehouse for food. House payments, instead of rent. Helping communities with jobs and growth is the best of charities. It is Christlike Charity. One comment was: "the LDS Church does not use Tithing funds to finance commercial developments. This money will come from the church's commercial investments which are 'for profit' companies that pay taxes just like any other commercial venture in America...no exceptions." The LDS Church runs the largest cattle ranches in the world, and is heavily invested in the rodeo skills which that entails. It would make no sense for them to abandon that. More importantly, this move insures that SLC will continue to have an excellent, modern multi-use venue for many types of shows, not just the Days of 47 Rodeo. The same effort which gave us City Creek Mall, and all the new LDS bldgs on Temple Square, will continue to make SLC the Crossroads of the West. Can you imagine the Roman Catholics neglecting Vatican City? Would Calgary give up on its famed "Stampede"? The Brethren are looking after the condition of their headquarters, and that makes good sense to me. "Heartburn" over contributions to public facilities puzzles me, particularly when those who benefit from and participate in activities in the facility include people from virtually every corner of the community. Would the community be better, if the facility were not built? Downtown Salt Lake City will soon have a new Broadway-style theater (George S. and Dolores Doré Eccles Theater) which will cost about $119 million to build. The facility would not have been possible without contributions from several private people and institutions--most notably a $15 million contribution from the Eccles (family) Foundation. There are countless examples of this type of philanthropy. Whether or not I personally value the kind of activities that will take place in the facility (theater, athletics, education, etc.) why should I regret the enjoyment of those who will? Why shouldn't I be grateful that the community is able to muster the support (from people and institutions--and sometimes even the Church) to make it possible? No sacred money was used. I am positive that there are not a million charities that I would give money to - too many of them spend far too much for "administrative" costs - read outlandish salaries and operating expenses. There are just too few where the money goes directly to the cause for which it is intended. No tithing funds or any other sacred funds were used in this donation - the article clearly states it, it has been pointed out, please let's stop with the repetition of ignorance. On the other side, even if funds come from the Church's profit-making companies and businesses, why wouldn't they be used for more charitable uses? The Church itself has several excellent charitable works that could have used the funds. What I suspect is that you have some individuals within the Church invest entities that are also sports fans. They also do a lot of business with the local community and have strong relationships with the Utah business community. Due to this commitment they probably have pushed this donation for goodwill within the community itself. If this provincial attitude is accurate, my response is clearly. "Stop acting like a Utah Church! You are a worldwide church with a responsibility to serve the worldwide membership." It is time to start bringing in investment professionals from around the world to assist in the placement of all funds for benevolent/charitable purposes. I hope they host a real circus replete with lions, tigers, bears, elephants and....Christians! I am far more offended by forced contributions (public debt paid by taxes) to fund stadiums in cities all across the country. The Church doesn't put a gun to anyone's head. The State does. So bring in investment professionals and pay their salaries with said money? I notice that anytime the Church donates money its critics come out and criticize the Church for donating. IMO It is just another opportunity for someone to criticize the church, they are finding evil in good. I am sure if money went to cure cancer there would be those who criticize why not diabetes? Yes that is very nice, but what about others countries like Mexico? in South America? in Africa? I am not aware the church is creating malls, stadiums, or other sources of jobs in those countries. Please show that I am wrong. It's the Church's money they can do what they want with it. Exactly! However, I am not expecting that mentality if our church is special. No! I hope our church donates money to Cancer research, but I doubt that is ever going to happen. Actually, Nehor, the church has a few different entities that manage their funds - whether they are funds from tithes or funds from their businesses. The issue I was alluding to is that these individuals are all in the Salt Lake Valley. Years ago I talked with guys at one of them on a joint investment (My career was in institutional portfolio management). We never did any business, but it was interesting to see their mentality and way of doing business. Instead of hiring guys from the SL valley it may be worth bringing professionals in from around the world to assist in the investing process. There are several layers to this - investment guidelines, international currencies/fluctuations, taxes, etc. Should I be directing my charitable donations to one of the Fortune 500 rather than the Red Cross or St. Jude Children's Research Hospital, then? Are you saying more people are helped if I donate my money to General Motors, for instance? 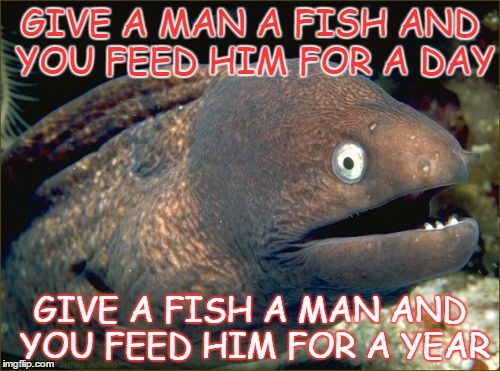 Give a man a fish he eats for a day. 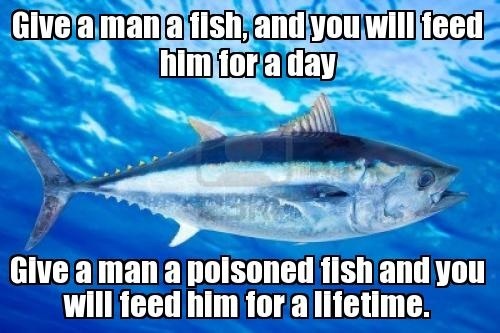 Teach him how to fish you feed him and his family for a lifetime. I don't think anyone criticizes the church when it donates to charitable causes. So is that a yes? I should be redirecting my charitable contributions to big business instead of reputable charitable organizations? There's nothing wrong with industry, but let's not pretend it's more noble to build a stadium than it is to donate money to cancer research, for instance. That's so ridiculous it's almost profane. Now when God realizes the errors of his ways, and puts me in charge. Donate to whom ever you want. Who talked about noble? The stadium is a business adventure. Which may or may not produce a profit. Also I donate to many worthy causes. The fact is that I also expect a return on investment from things I invest my money in. Donate to whom ever you o m.
I gave you a rep point because in real life..this makes great sense for businesses..but I, for one, hate to think of church's as business or corporations..you just sustained my belief here that although the church gives to some worth causes..it is a business..to make money..invest..make money again. This may help others I understand but to me, it is not true charity. As for investment purposes..the corporation is made of members who contribute..they should expect a return too..or at least know what they have invested into. Tithe or not, the church ultimately gets moolah from it's members!! Also so in case anyone thinks that quote is ancient it has been misattributed all over the place to Solomon, Confucius, Lao Tzu, Mohammed, and even Jesus. It was actually first found in the 19th century and appears to have no divine mandate. I don't expect a monetary return on investment from my membership in the Church. I want something far more valuable, life with God. Unfortunate we live in a world that operates on moolah. Without which many valuable things wouldn't exist. The Church paid dearly for not having a business model where it comes to its financial resources, It was dead broke on more than one occasion. Also I remember well when each Ward was responsible for its own operating funds. Just keeping the lights on was a big expense. I prefer the currant business model though I'm sure improvements can/will be made. I hope improvements will be made. I can't afford to go to their mall. I can afford to shop pretty much where I want, but live too far away from Salt Lake City, about 1000 miles.